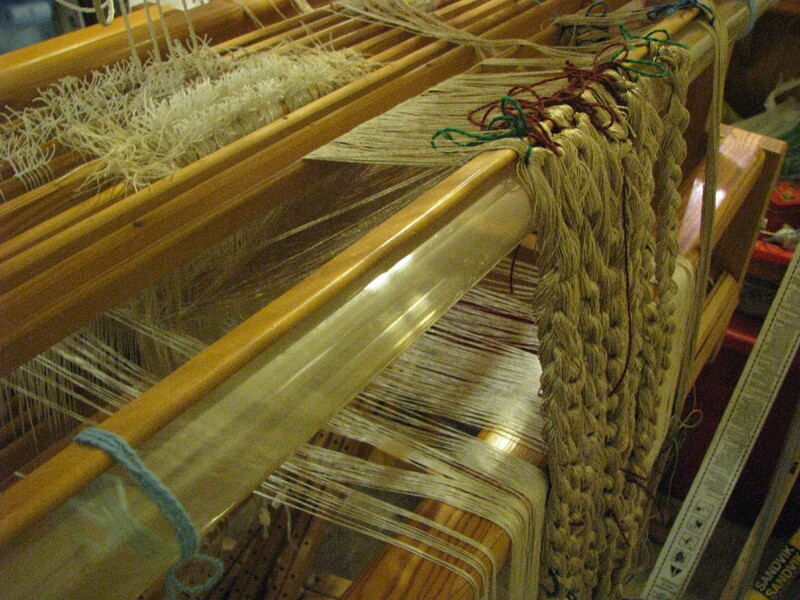 weaverhall | Weaving, Family, Research and other stuff too. Weaving, Family, Research and other stuff too. So this weekend, thanks to my lovely friend G, I have completed my very first yarn crawl. For those who haven’t been on one before, yarn crawls are a way for fiber enthusiasts to take a self-guided tour of local and semi local purveyors of fiber-y goodness. There are passports that you take and get stamped at each participating shop,so that you can be entered for drawings, get cool patterns (knitting and/or crochet, though I have heard of weaving patterns in some areas), and there is also a prize for finishing; this year it was a knitting needle gauge with five inch ruler. We went on the Fall PNW Yarn Crawl; this year’s theme was “Yarnia” Most of the shops had something to tie in the theme; our last stop had a needle felted Mr. Tumnus in the window display. Another two featured Narnia inspired patterns. Several had Turkish Delight for people to sample. At one shop, the commemorative stitch markers were Narnia themed or Dala horses. The wonderful thing about yarn stores is that they are all individual. Some yarns and notions at can be purchased at big box stores and there are some large fiber/textile places online, but, by and large, yarn stores are an independent lot. That was my favorite part; seeing each store and how it differed from the others. One place was on a farm where my daughter, Miss M, got to feed alpacas and chickens. According to her, the best part of the entire trip was lunch at Wendy’s; I do wonder about my children at times. She did concede that feeding the chickens and alpacas was also fun. With the exception of some of the big name yarn companies, there was very little overlap in the stock at each place. One place had a wonderful lot of books and magazines as well as a fiber corner. Another had a cute display of rain-boots with knitted boot toppers. 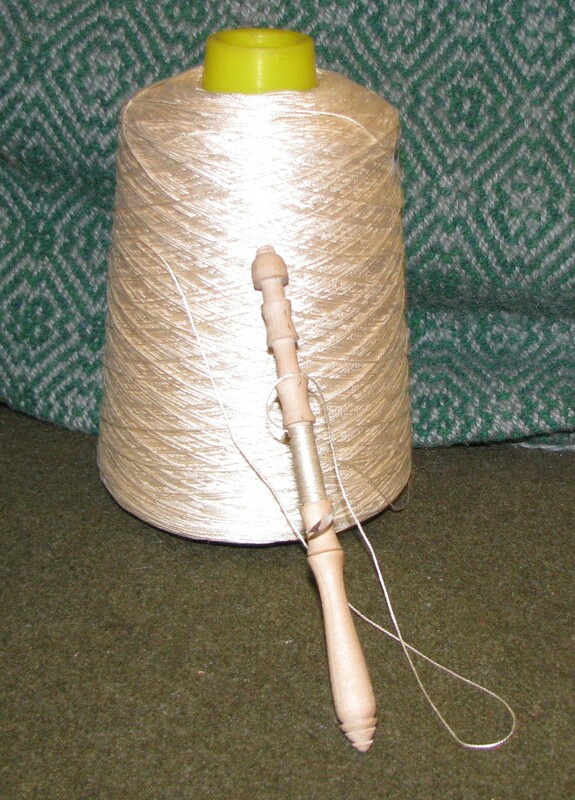 Still another had my favorite brand of linen weaving thread (Normandy linen in 20/2); this brand is my favorite because it comes in cones which set on the ground for easier measuring of warp. One place even had my dream spinning wheel, Kromski Minstrel. It belongs to one of the spinning instructors; some day I will get one of my very own. And yes, I ended up with more than a Dala horse stitch marker. Found some lovely variegated green yarn for a hat requested by eldest child, J; fulfilled a years long desire to purchase some yarn by Jorstad Creek (Isle of Skye in Delta Blue) that will become a hat for my grandmother and a few other things that decided they needed to be purchased and live in my stash. In conclusion, if you haven’t been on a fiber crawl and have the opportunity, go! Don’t worry if you can’t finish it. Let it open your horizons to the fiber-y goodness available and support small business at the same time! In pursuit of more hands on experience with medieval weaves, I decided to make a semi-reproduction of a 12th century shroud. But first a little background: For those who are unaware, I am a member of the Society for Creative Anachronism (SCA) and every year my area (Kingdom of An Tir) holds what is known as an Arts and Sciences Competition. I wanted to compete this year as a single entry, meaning I was not going for the championship title; personally, I think being kingdom champion would be a lot of work. Thus I needed a project. As I had only a few months (I’d decided to do this in December for a competition in early March), I also needed a project that could be done fairly quickly. 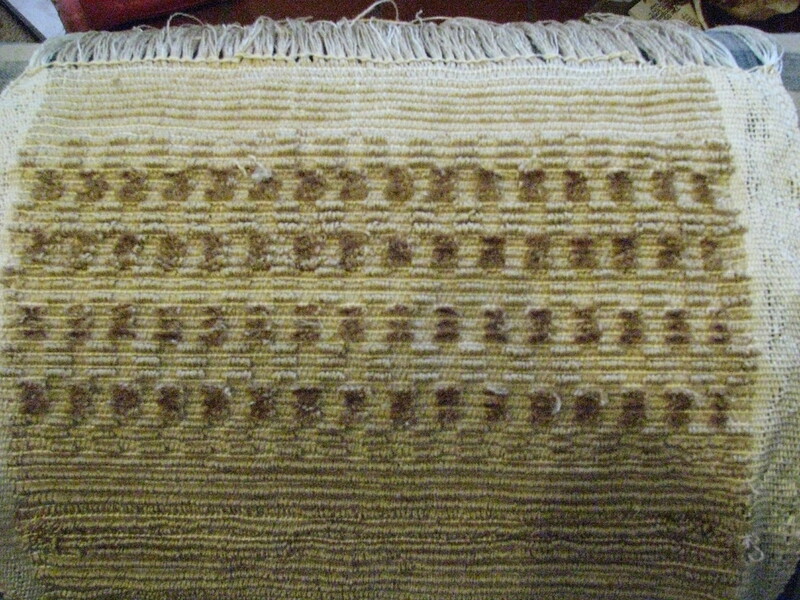 I’d read the article by Carolyn Priest-Dorman in Complex Weavers’ Medieval Textile Study Group News Letter (Dec 2001) http://www.cs.arizona.edu/patterns/weaving/webdocs/mnm_mt30.pdf on medieval linen weaves several times and had ignored this draft. 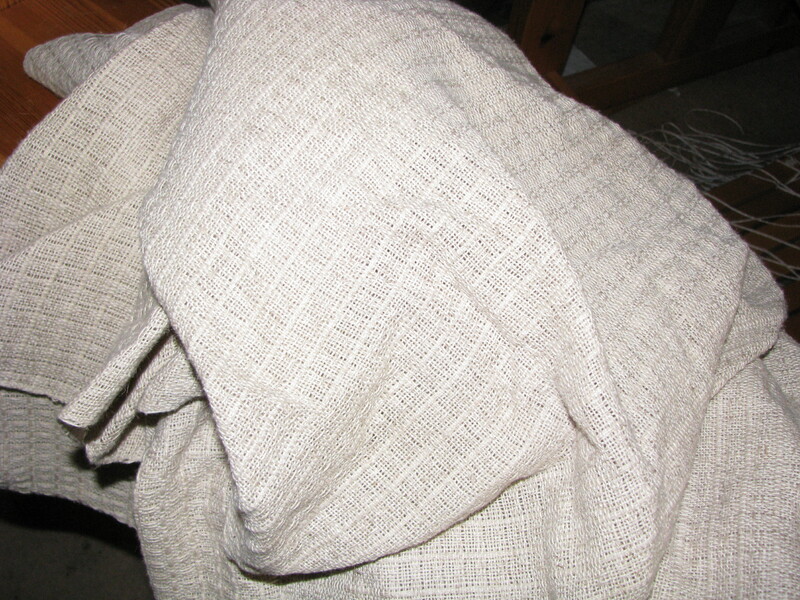 This shroud does not contain linen(thus the reason I was ignoring it in pursuit of medieval linen weaves; it is a cotton/hemp blend. While cotton and in fact cotton blend cloths are not uncommon later, the fact that this piece dates to around 1178 makes it very unusual. Based on the evidence (part of which is an analysis done by Naomi Moore in 1990), my personal feeling is that this piece was made in a professional workshop in Northern Italy. Part of this feeling stems from the fact that there is a word in Italian for hemp cotton blends; bombazine. In addition, city state such as Genoa and Venice had strong trade ties to what we now call the Middle East. According to Moore’s analysis, the cotton used in the ribbing and the weft had more in common with cotton from Syria than that grown and exported from Sicily. Then there was the question of the hemp. That proved my sticking point for a bit until I found out that Burgundy was known for its high quality hemp. It seemed to me that it was more likely for the cotton (being the high quality stuff that appears to have been used) was imported into the Italies from Syria (probably via Acre) and that the hemp was exported to Northern Italy from Burgundy. Onward and weaving ward. 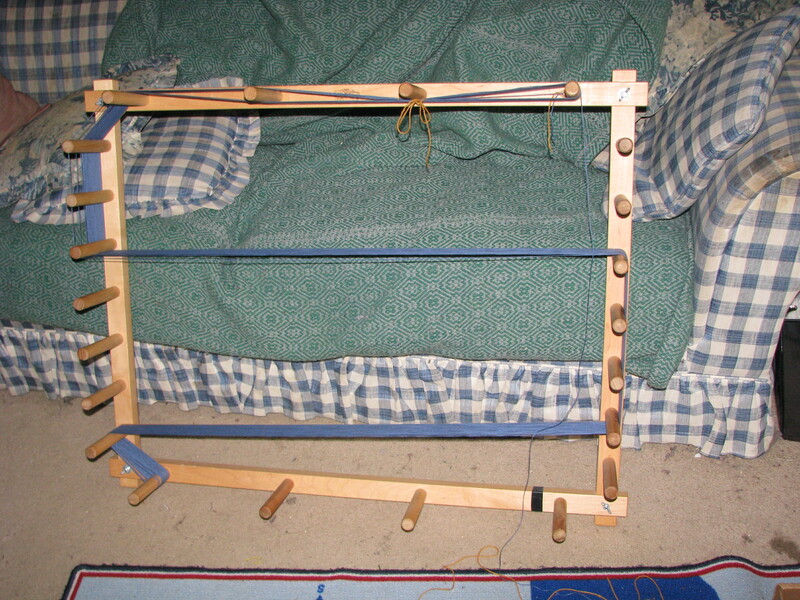 So after gathering materials I set up my loom for this. Very interesting as I got to use (for the very first time) all eight shafts. At any rate. I got about two inches of weaving done and realized there was something wrong! So, with less than two weeks until my deadline, I cut off the offending portion and resleyed the whole project. 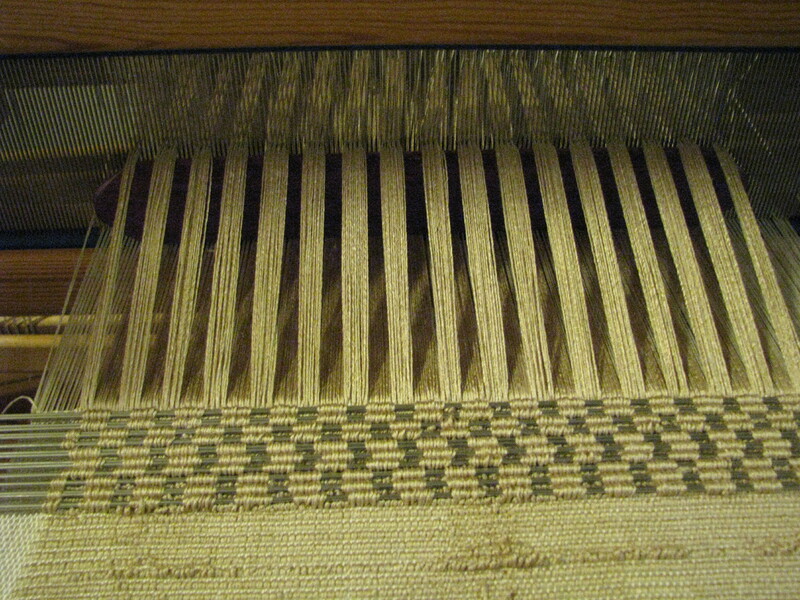 (Sleying the heddles and reed are my least favorite parts of weaving). This time it goes better. 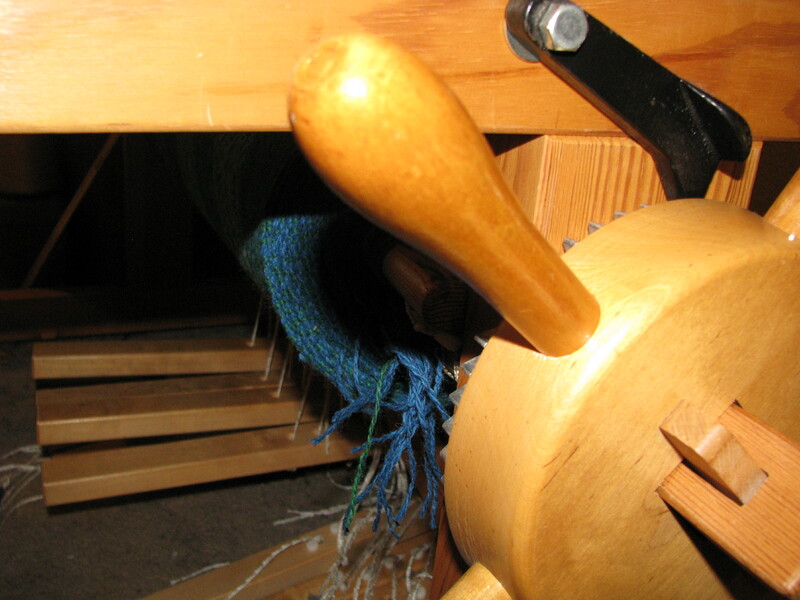 There are still tension issues, but that is to be expected; there are two different weights of warp happening. 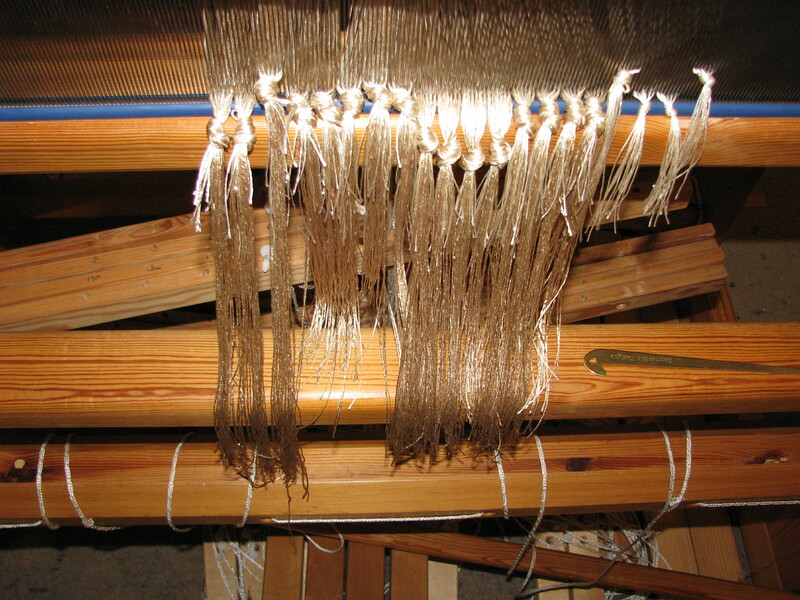 The main warp, hemp, is wound on to the back beam. 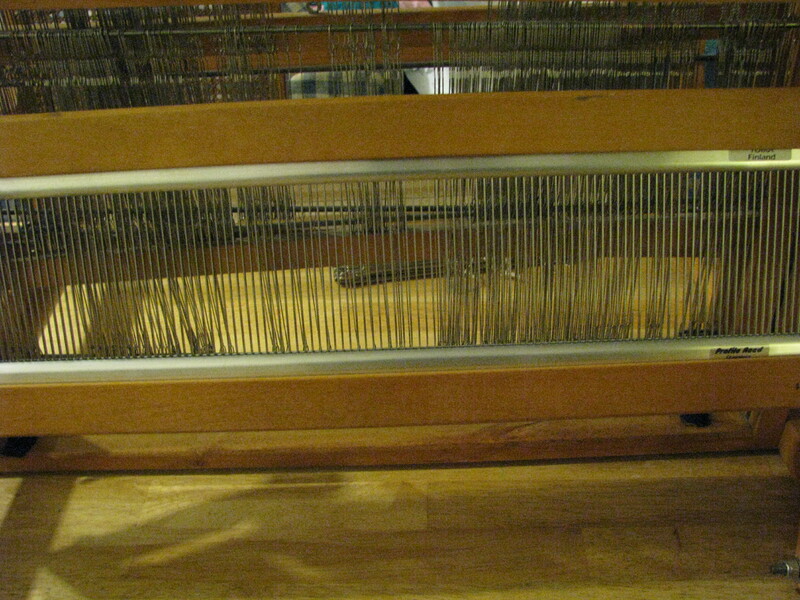 The ribbing warp heavy (8/8) cotton is weighted separately and simply hangs off the back beam. Supplemental warp weights are about 8 oz each. 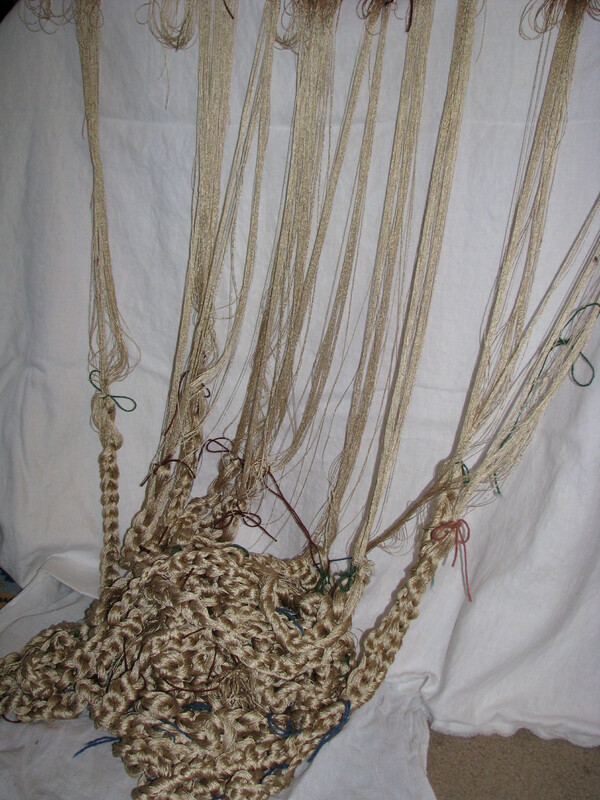 Then every so often an individual warp thread of the hemp variety decides to play it loose and make the weaving more of a learning experience. I learn in this case not to use two paperclip holding weights adjacent to each other; paperclips are friendly types and want to be close to their neighbors thus interrupting my nice tension fixes. The individual thread weights are .5-1oz. 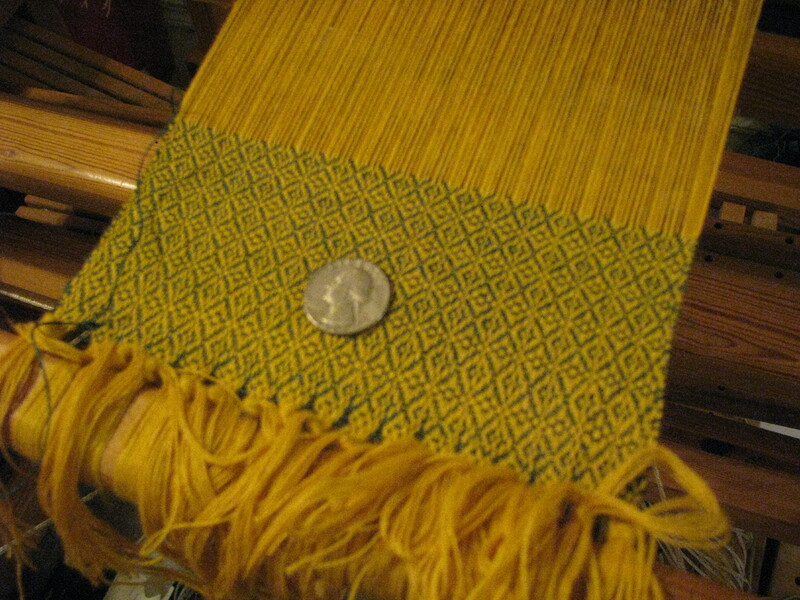 The weft (12/2) cotton was actually rather fun to use. I’d’ve rather used 6/1, but I have no source for same. (I’d love to hear of one, by the way). Mostly, I’ve not used cotton; sticking to linen and wool. At any rate. On it went for several days in between appointments, taking care of family, and work. There were several issues with the selvage; not ridiculously unusual for me, but this time it was the left selvage; normally the right side gives me issues. The issue had to do with how many base repeats I had on each side; on the left there was a single 1-2-3-4-5-4-3-2-1. 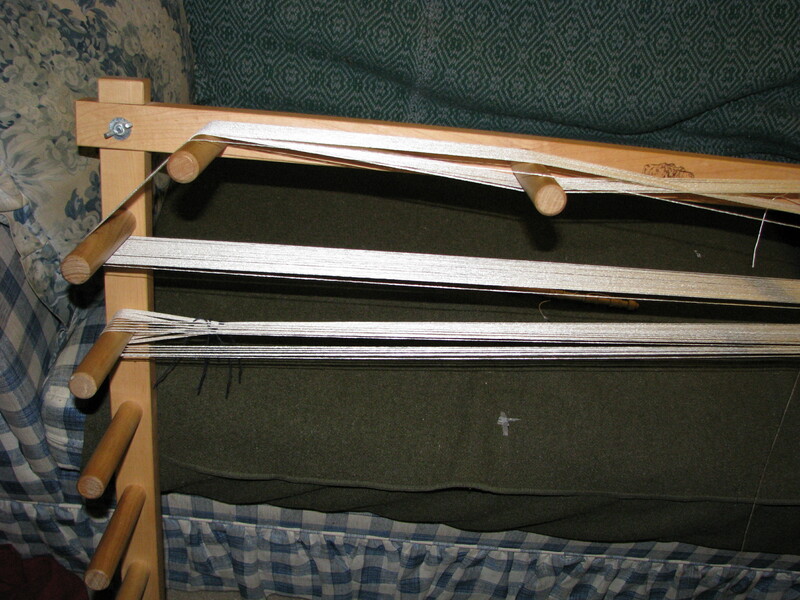 On the right hand side there were three repeats and there is a 5 in there separating the doubled 1s, this gave the selvage itself something to stabilize it. I added all the broken threads in at one point and things went better for the last yard +. I admit to being very concerned about the feel of the fabric; very sleazy. Then it was washed and became woobely instead. Woobley is a great improvement over sleazy. Part of the fix came from all the cotton pulling in and playing nicely with the other threads. Don’t know that I’d ever use this for clothing, but perhaps a shawl, too many floats for anything really utilitarian. Got a bit of a surprise at the end. I didn’t know that I couldn’t see the pattern. I figured it would just come out in the wash as some do. But what a happy surprise to see all the pretty little lozenges. The final surprise was after it was washed. I knew which side I’d looked at whilst weaving, but out of the wash, it was hard to tell what was “supposed” to be the front. Based on the picture in Naomi Moore’s article, I’d say what I thought of as the back is really the front; fewer long floats. 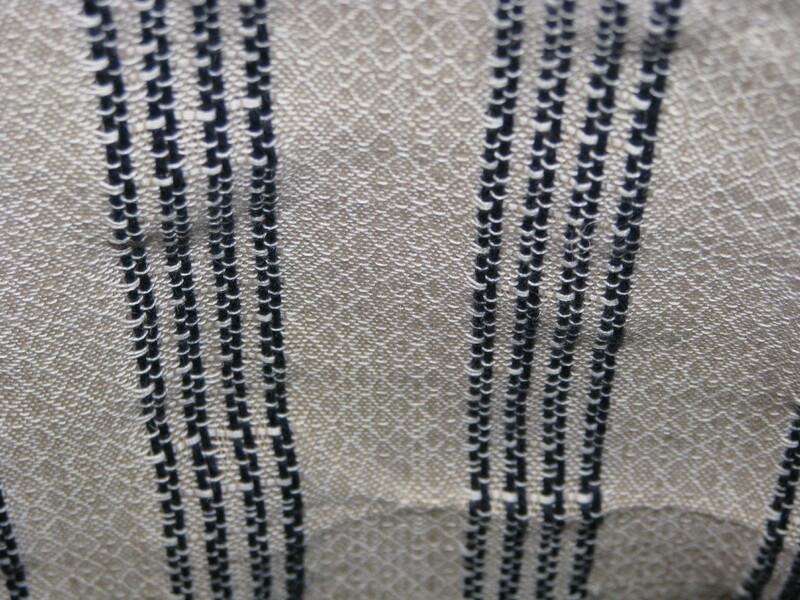 However, the side I saw while weaving is more dramatic due to those same floats (they’re dark indigo). So which is the front? All in all, for what I wanted it to be, the project was a success. It might not be as perfect as I might want, but the final cloth will be cut up, part to the portfolio and part to become a table runner. This past July I acquired a beautiful new to me Glimakra Standard. I named it Bjork. Bjork came with a sectional back beam. All very interesting, however, I don’t have most of the other equipment needed for sectional warping (yardage counter, tension box, and so forth). If I wanted to weave on Bjork, I could either take the sectional bits off or figure out how to beam the warp without all the additional goodies (not that I don’t want the other goodies). 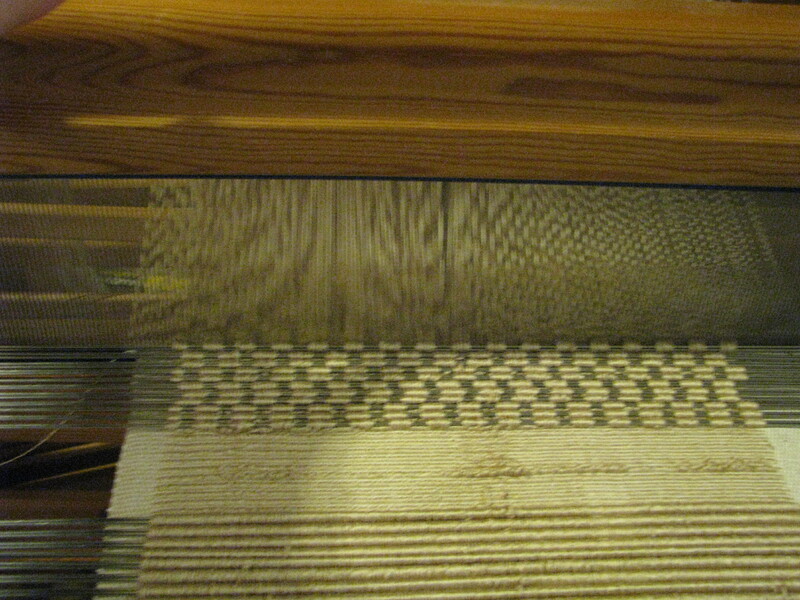 Here is what I did: I measured out the warp in ends per section. The sections on Bjork’s sectional beam are one inch wide and I wanted 16 epi. Thus, each bout has 16 ends. I left the lease sticks in and they function a little like the tension box in evening things out. Each section is attached to a string on the back beam. The inch wide section is knotted and then a lark’s head knot attaches it to the back beam. 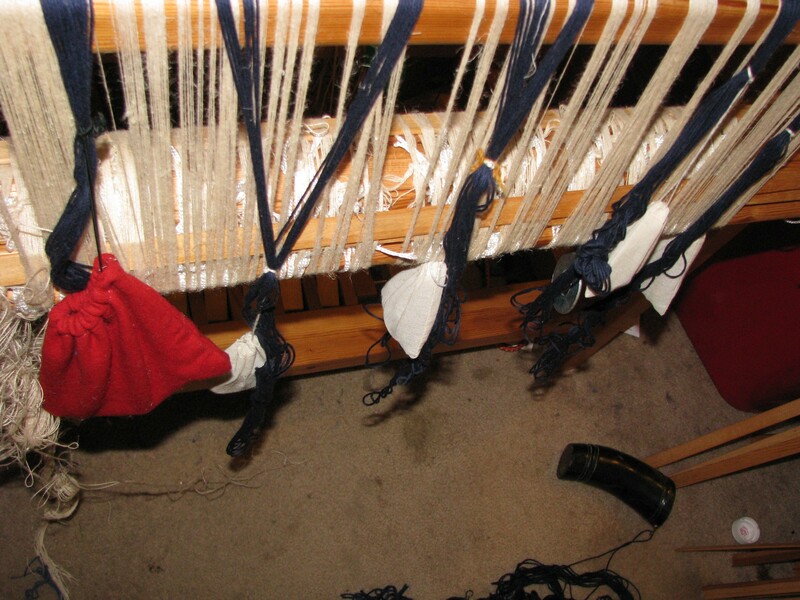 It took a while (seven inches) to figure out that I needed an additional way to spread the warp into the beautiful ribbon that one sees in the books on sectional warping. 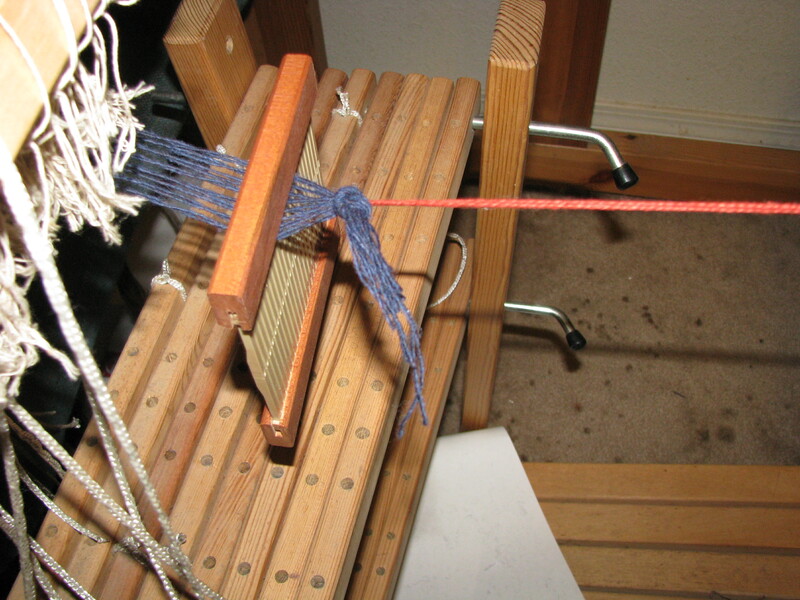 I used a small piece of rigid heddle reed. Then things are wound on. 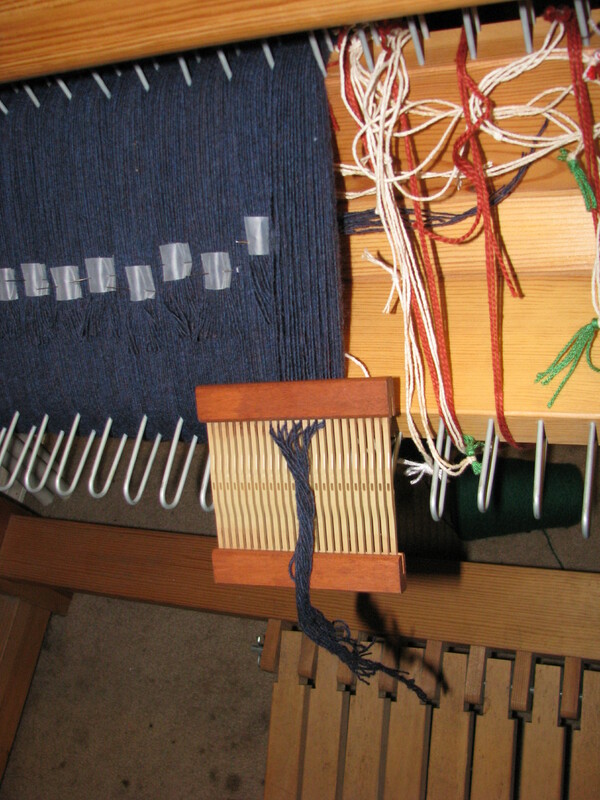 Once I added the bit of rigid heddle reed, things got somewhat easier. After each section is wound, it is taped and pinned to keep it in place. There was a lot of walking from back to front to adjust twists. I also had to be careful not to whack my temple on the inside of Bjork’s castle; I’m just tall enough I have to duck to get out of the loom. All in all, I am quite satisfied with this warping method. 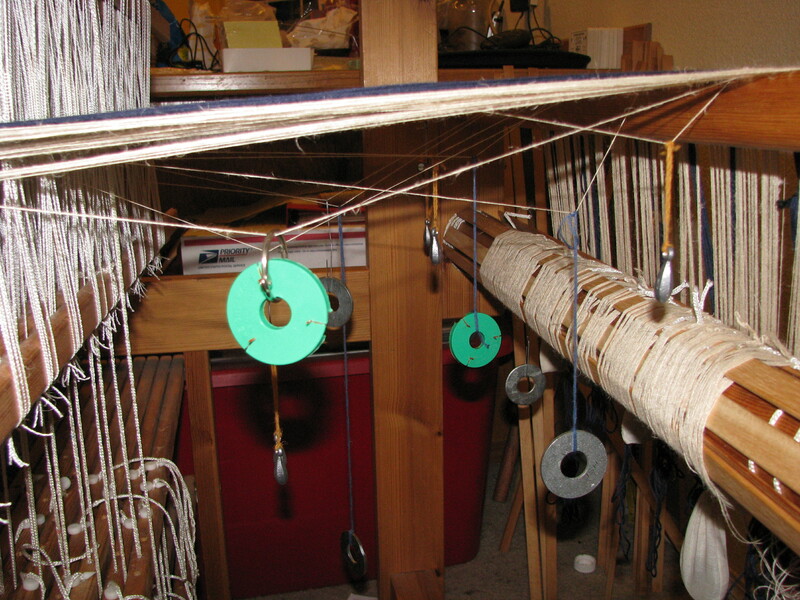 It may take longer (each section took 15-30 minutes to wind, depending on how cleanly it was chained) but I was able to warp without major help from my very patient husband. This past weekend I was able to take a class on velvet weaving with the wonderful Barbara Setsu Pickett. It was good to work with other weavers on velvet and have a teacher that had woven velvet as well. A bunch of prep work had to be done before the class, including building this piece of equipment called a cantra, or bobbin rack. 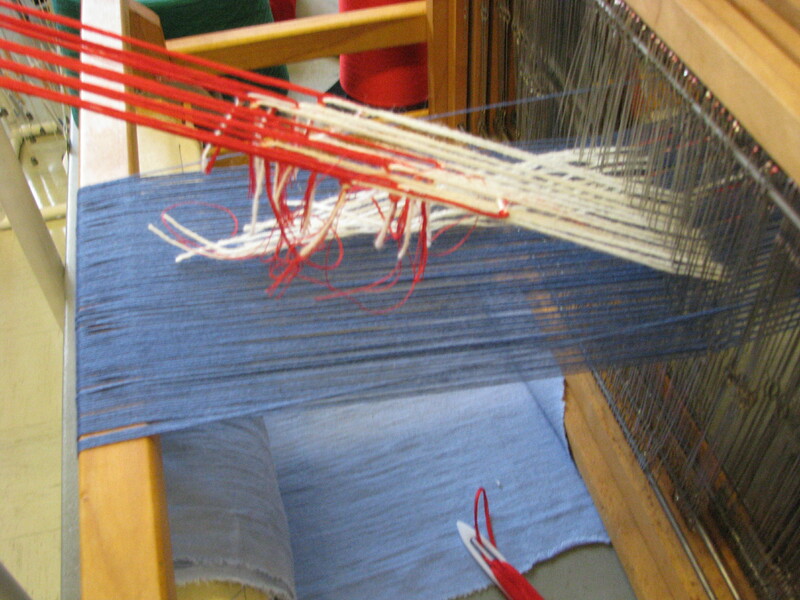 It is used to help keep the pile threads organized. The cantri we made are of pvc pipe with the grid being a cut down piece of light diffuser. These are quite small in comparison to cantri used by velvet ateliers in Italy and France. 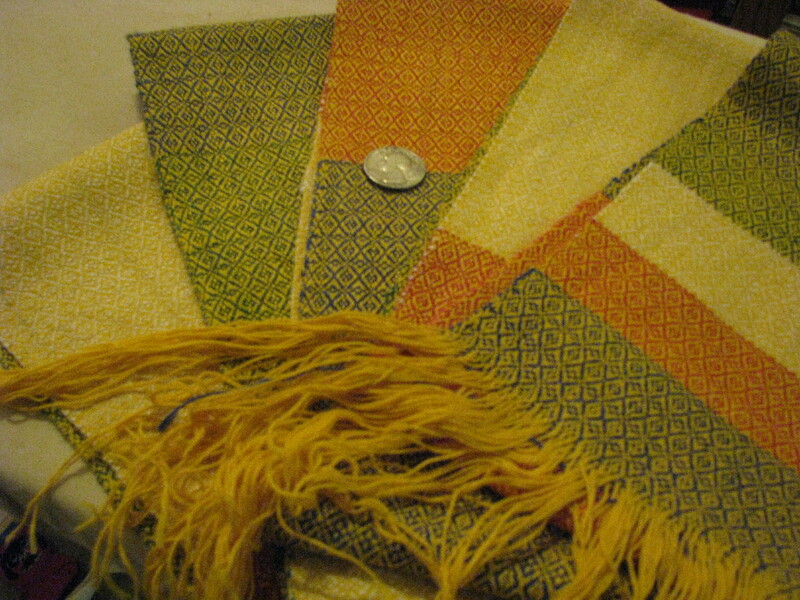 For this project I used cotton; unusual for me. 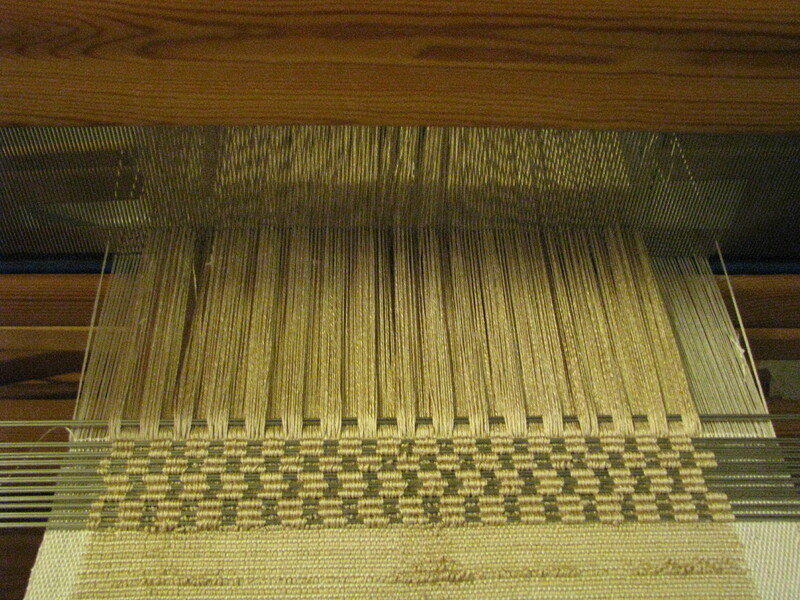 The ground warp is 8/4 cotton rug warp and the pile warp is 20/2 cotton. 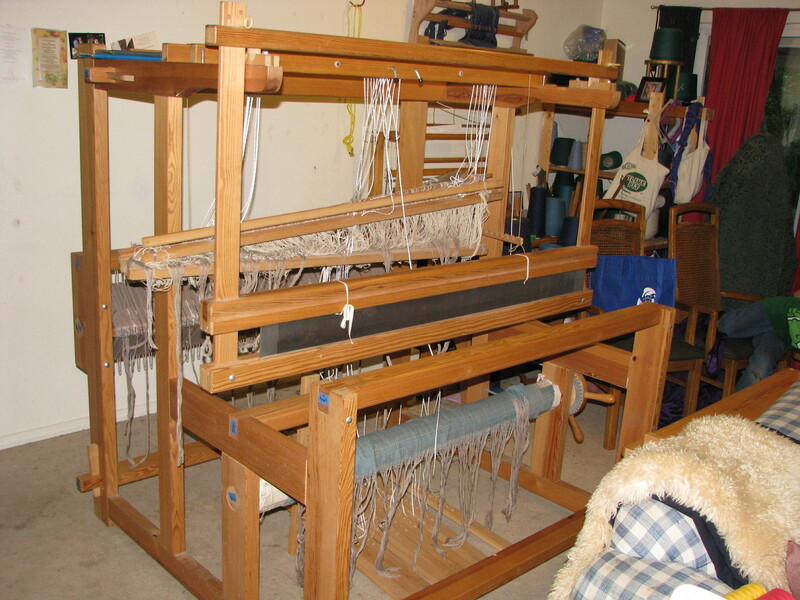 Of course, the warp had to be wound and the loom warped at home. Ended up needing a new reed as sleying a 12 dpi reed every other wouldn’t work for this. The dents need to be big enough for the threads to move around. The ground is sleyed at 18 epi with six pile units per inch. 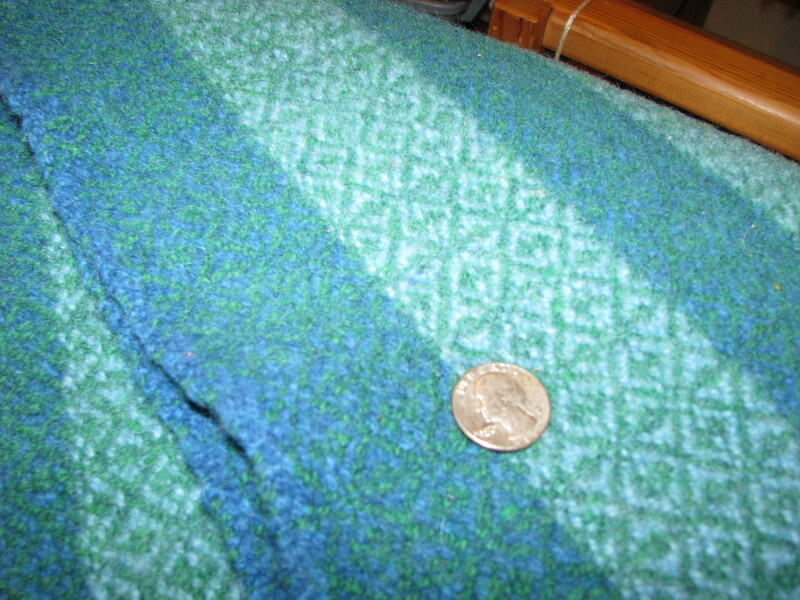 Each dent (in the main part of the fabric) also gets one pile unit consisting of 10 ends of 20/2 cotton. The one other thing I was able to do ahead was putting the weights on strings. Each weight is 1/2 ounce and is used as needed on the pile units. O for not having the netting shuttles ahead of time! 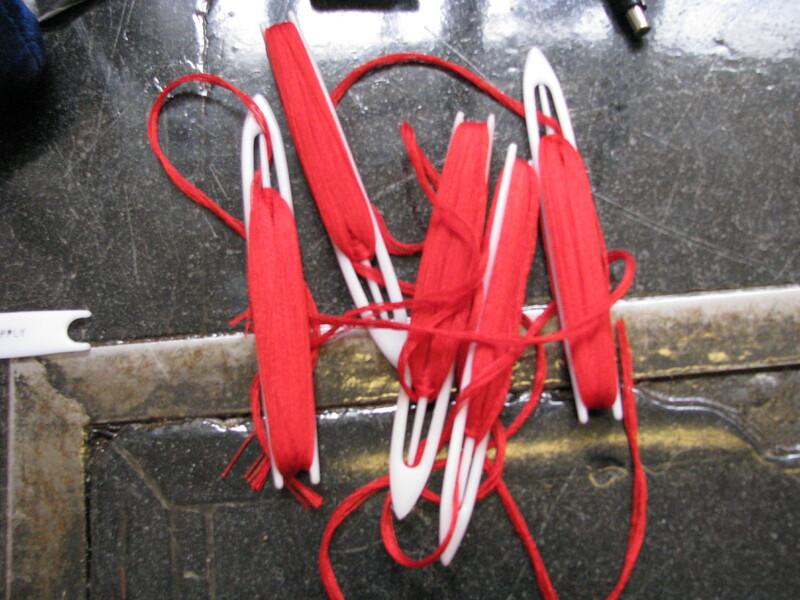 I got to spent time (most of the first day) winding shuttles with their pile threads. For this I got to learn how to make a paper quill for weaving (and conversely how not to make a paper quill). Then I got to learn about spool racks. Really this was a very interesting spool rack; it had three sections of twenty rod things. You may note the empty quills on two of the rods. Why did you not put all ten quills in the same column, you may ask. Simple. Barbara said to do it this way: Two columns of five quills and then weave the threads back and forth through the upper rods. Then put them all through a small ring so that one can wind them as a unit. I gather this is similar to using a warping paddle. The finished pile units are reasonably well behaved and remind me of ribbons. I ended up making 26 shuttles. One can use a warping board and warp 10 ends and then load the shuttles. I do find this a little easier; it also takes less set up. However, I could see a spool rack in my future. Next we get to put everything together. The safety pin looking thing is a large stitch holder for knitting. It creates a cross for the pile units. It helps keep everything organized; that’s all I know. Yes, the pile units could be spaced closer. Keeping them farther apart helps keep them from tangling. View from the bottom. It is not a cat toy, no matter what it looks like. Theoretically, all the shuttles should be at the same length at this stage; I’m rather fond of theories. The lower the shuttle, the longer weaving time you have. Next the pile units get attached to the dummy warp. 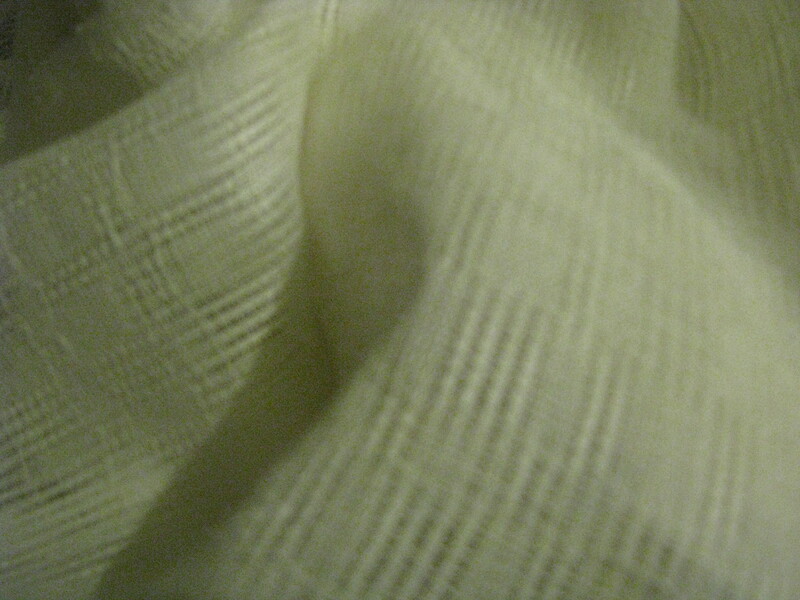 The dummy warp is the white yarn. All it does is mark space and make it easier to pull the pile units forward. Dummy warp attached to pile warp. Once all the pile units are through, they are lashed to the front beam. A note for the future: Do not tie the dummy warp in with the ground warp on the front beam; tape it in place. 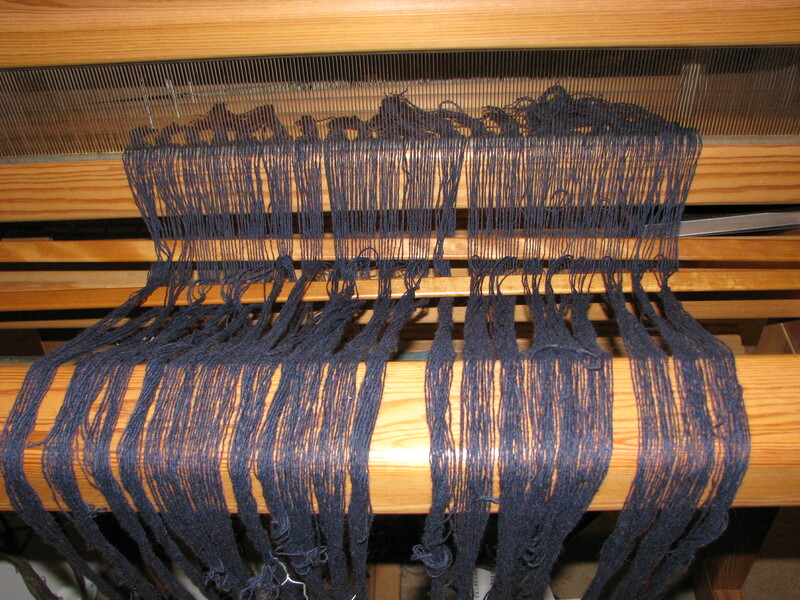 Otherwise you get a bit of a mess in the front from the excess yarn from the dummy warp. Front view with dummy warp. Finally the weaving! If you look very closely, you can see the lashing for the pile warp. Each on of those dots represents one pile unit. Velvet, with all its cut pile, tends to be a bit unstable. 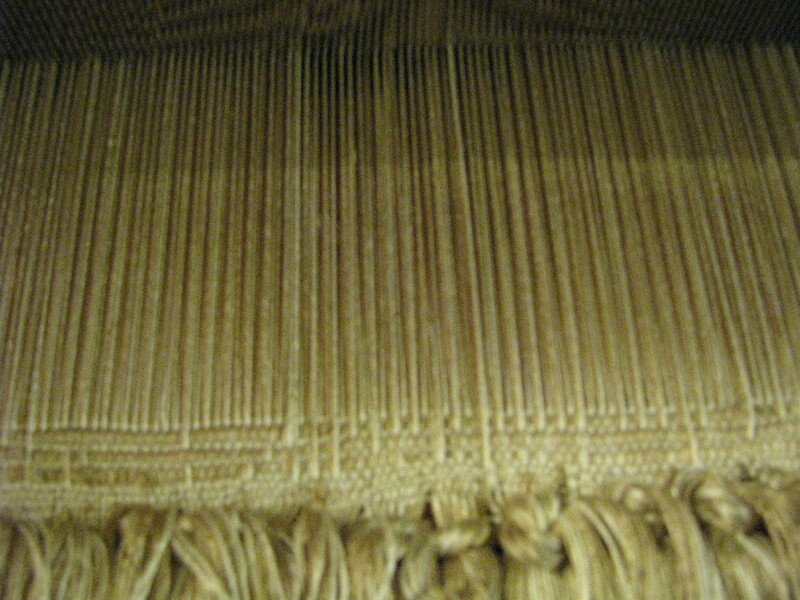 This is why when weaving, there are selvages, headers, and enders (for lack of a better term). 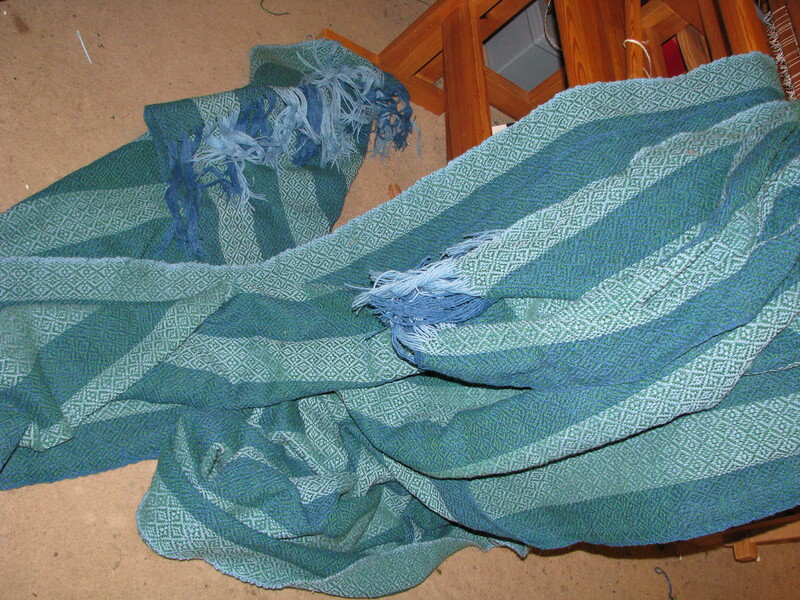 After one has spent hours upon hours weaving, one doesn’t want it to fall apart! And finally, pile. There are three ground shots between each pile shot. After one puts in all the rods one has, one gets to cut the first one out and carry on. This type of velvet is solid cut pile velvet. 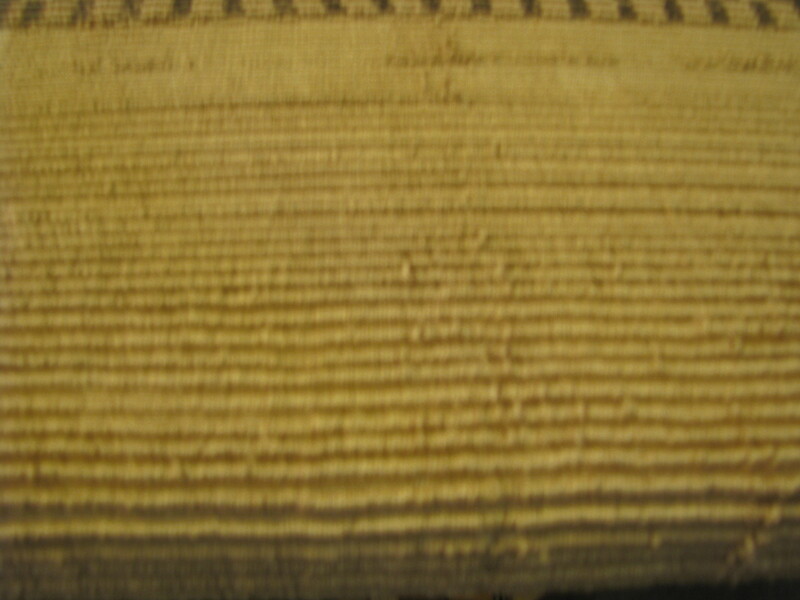 We were told about a technique called laminato where there are four picks between each pile pick and the fourth uses metallic thread that can only be seen in sections of voided velvet. I will have to try that sometime. In which I endeavor to weave velvet again. The beginning of the adventure included deciding upon the thread. I had some 2/12 silk that I’d purchased via eBay wandering about my stash and decided that this was the project for it. This is for a couple reasons: I’ve never worked with all silk and all silk is what velvet has been “traditionally” made from. The third factor is that I wanted needed to up my game by using a finer thread than that of my last sampler. 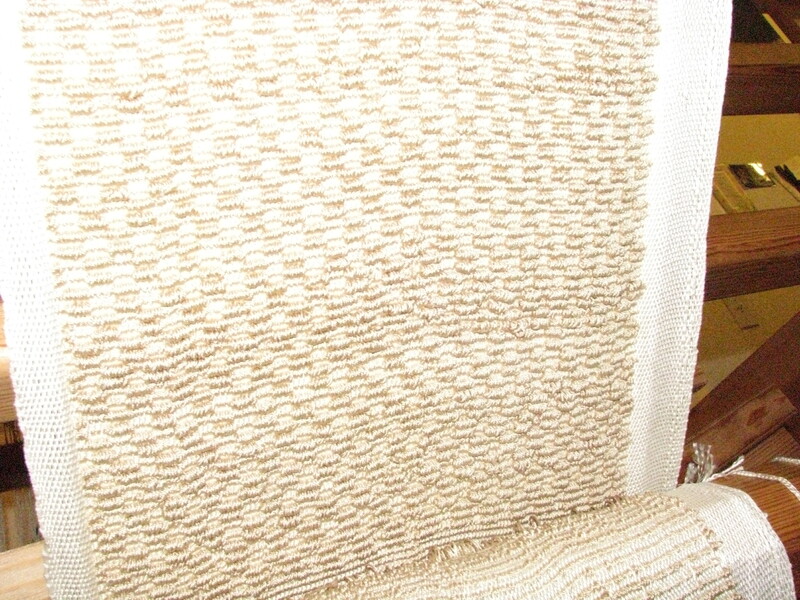 Now that the materials have been decided upon: White for ground and weft and pale gold (champagne, perhaps?) for pile, sett must be decided. The sett chosen for ground is 24 epi. Very beginnings of sett figuring on a cool little tool for figuring wraps per inch. Silk is shiny! According to a couple sett charts, twill sett for the silk I chose should be about 20 epi. I chose 24 because I have a brand new 12 dpi reed, and I’d read that silk doesn’t bloom as freely as wool or cotton. 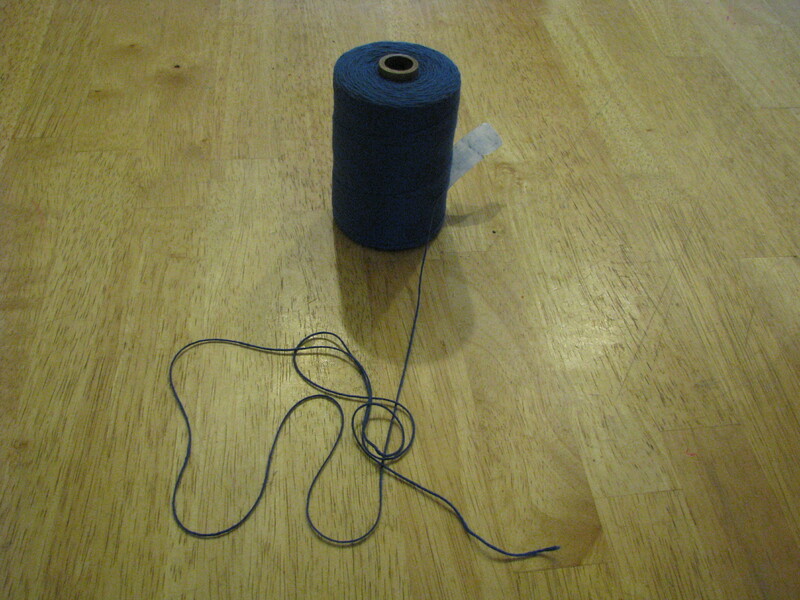 Based on that, I figured a couple extra threads per inch could only be of assistance. I decided on a pile set of 48 epi. This brought the center portion of the samples to a whopping 60 epi! This is the most I’ve ever worked with. (The previous record for me was 40 epi and that didn’t work out so well). Sett and materials have been decided, press forward to measuring the warp. 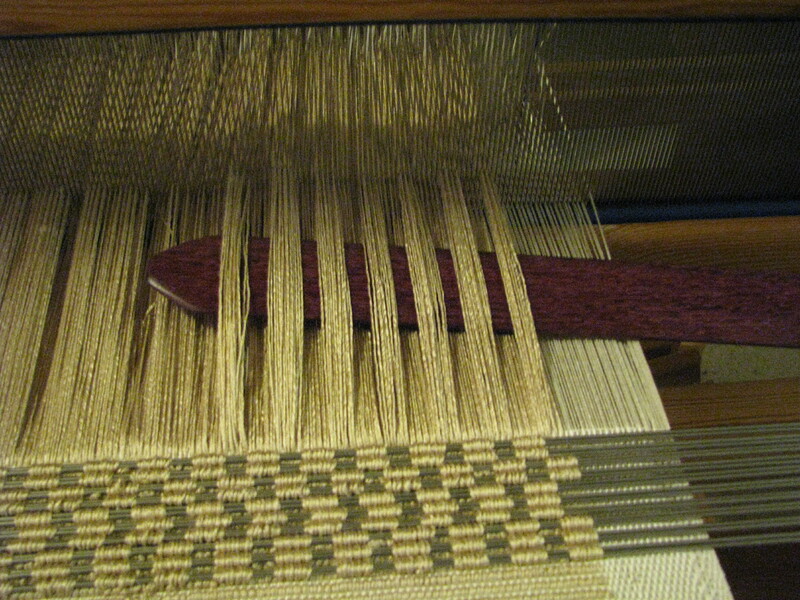 I’ve always been rather fond of this step, for me, it is one of the most meditative in weaving. Having silk run through my fingers simply added to the experience. The ground was measured at about 2 1/4 yards and the pile at 10 yards. Why the difference, you ask? Velvet pile has a different take up than the ground. It is also not beamed with the ground warp. This adds some interesting challenges. But back to the process. 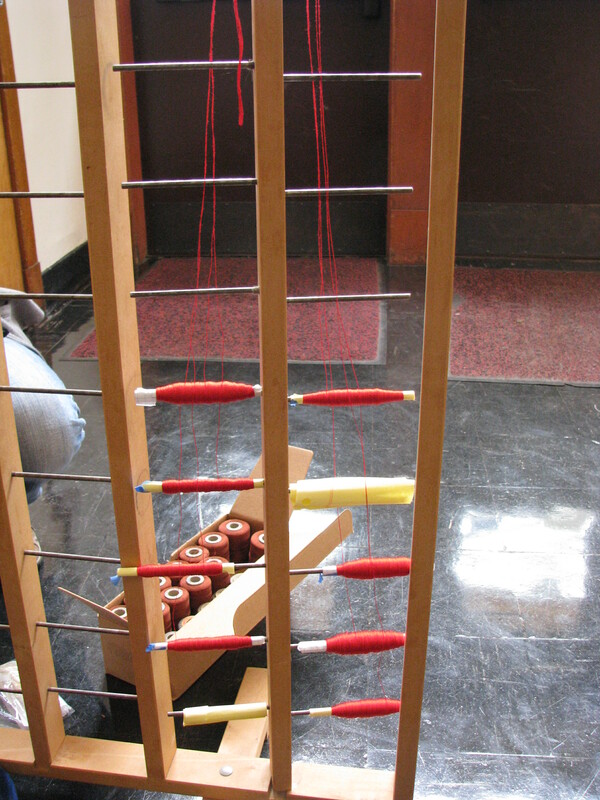 From experience, I know I will lose 27 or so inches to loom waste; I am working on a Glimakra Ideal, for those who wonder. This will leave me with about 1 1/2 yards to play with for my samples. 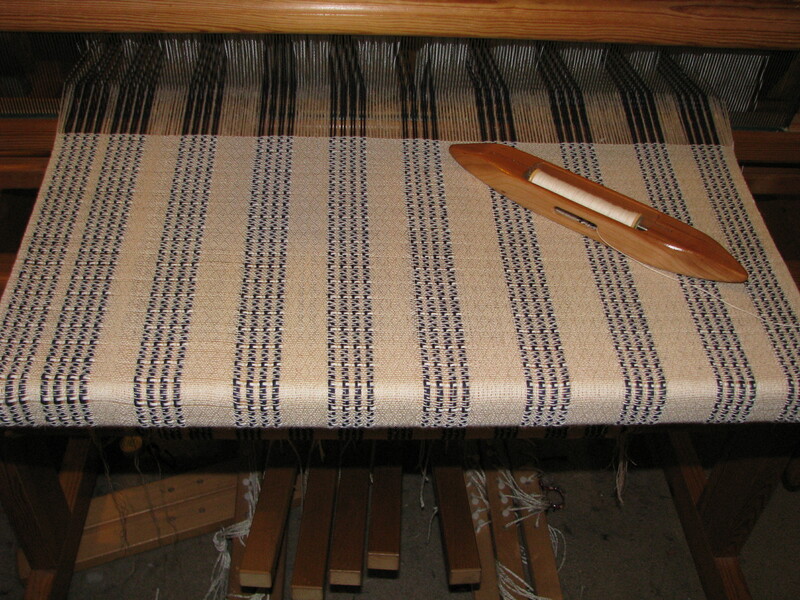 The warp length was determined by guess and by gosh and I decided that 5x the ground would be about right. The old Renaissance velvets, my inspiration, could have piles 7 or more times the ground warp length. There is a formula for determining how long the pile warp should be, but it supposes that one knows what the height of the pile and how many pile picks per inch (or centimeter) one is aiming for. I knew neither part of the equation. Now ground has been measured and beamed. 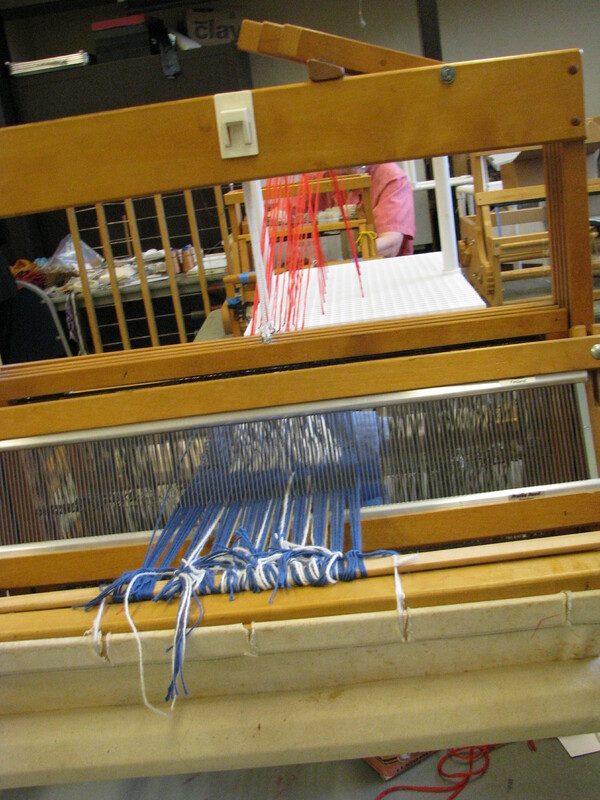 Then the warp gets measured and chained but not beamed. What? Why not? I am so glad you asked! The simple answer is limitation of tools. If one has a second back beam, one can beam the pile as usual on to it. If one does not, as I do not, one must find a way around. What I chose to do is leave the warp pile in their chains. Chains of pale gold pile. Shades of Rapunzel and Rumpelstiltskin. 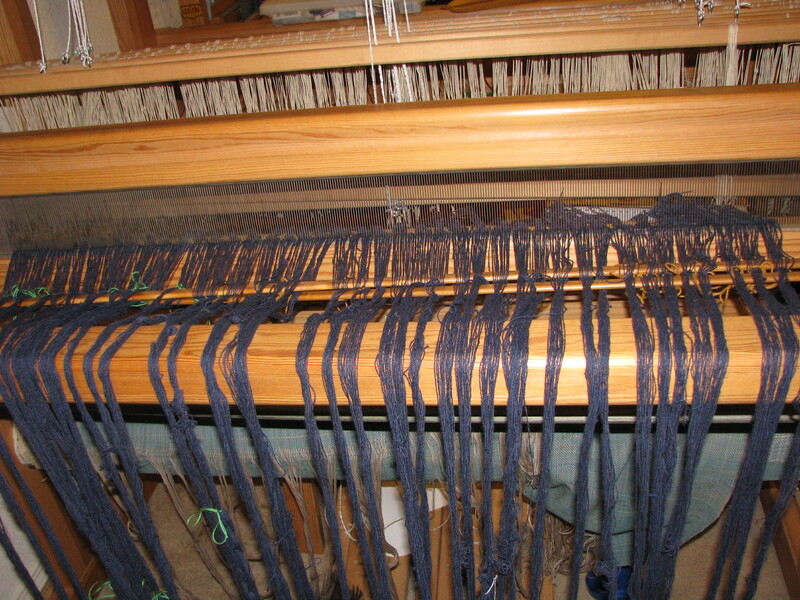 Pile chains over a tube lashed to the back of the loom. That lease stick stayed in for the whole project. Each of those chains got a weight sack tied to it. Now having planned for this. I measured only one horizontal inch of pile per chain(there were ten) save for two chains which were half inch. My idea was to weight the chains with pill bottles filled with pennies. However, I found I didn’t have enough pennies for four ounces of pennies per large chain of pile warp. I ended up using spice infusion bags filled with washers (and yes, some coins) as weights. One (of many) interesting things I learned was that I think I might not have enough heddles to do a project, I probably do not. 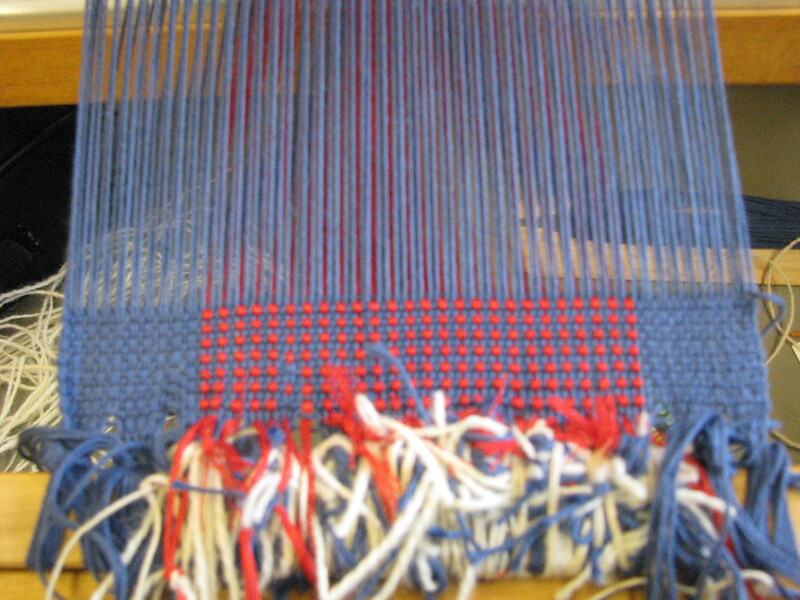 I ended up making over 100 string heddles; densely packed warps do have their disadvantages. 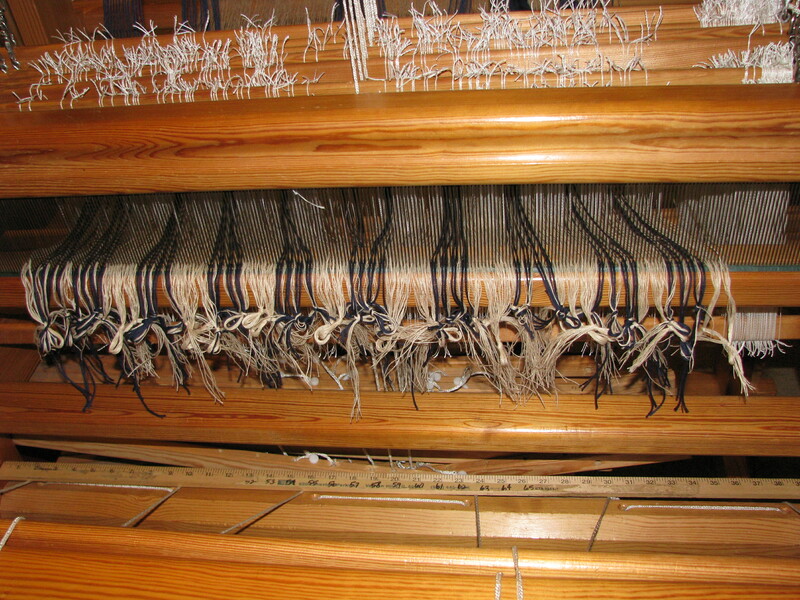 There is a related law of weaving to this, if one has more than one loom in the house, they will never use the same type of heddle. Heddles; some of the dozens I made for this project. Lest I forget, I did manage to write a draft for this project. 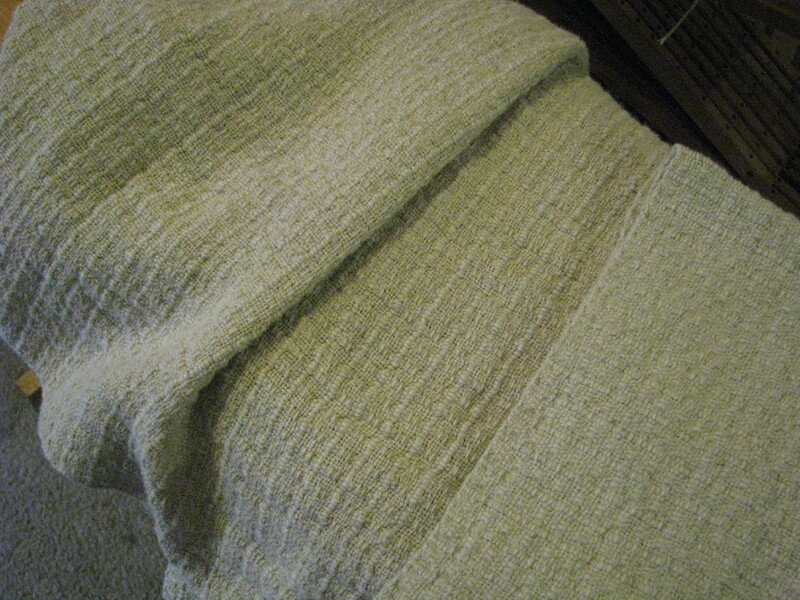 The ground is tabby as I could not wrap my mind around twill whilst dealing with pile picks. The Gs are ground, the Ps are pile and Ss are selvage. Speaking of tie up. I re-did it at least three times. There are reasons (other than lack of training) I do not design tie ups. Onward and weavingward! Everything gets tied (together) to the front beam and the header is begun. 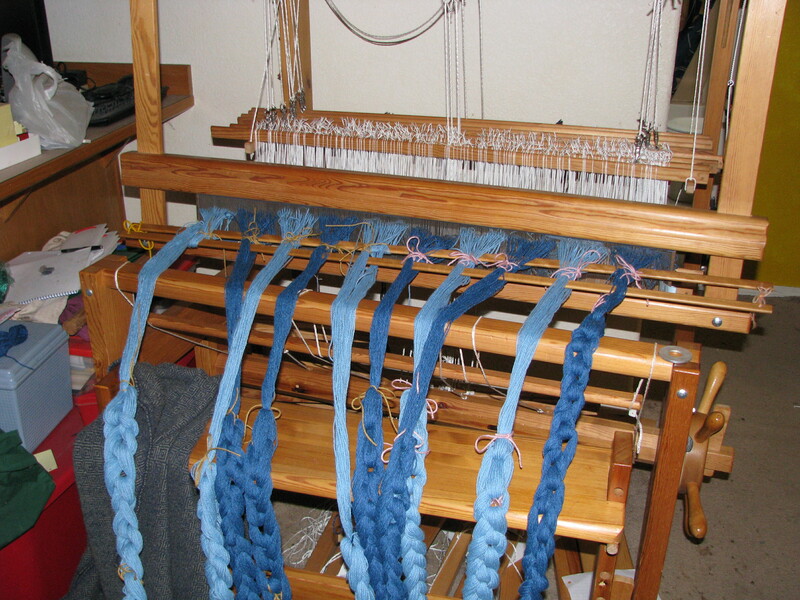 According to Robyn Spady, one must always weave a header on velvet just as one must always have selvages on same. This is for purposes of stabilization. Personally, I’ve never been a big fan of selvages, and that will become obvious later in my process. 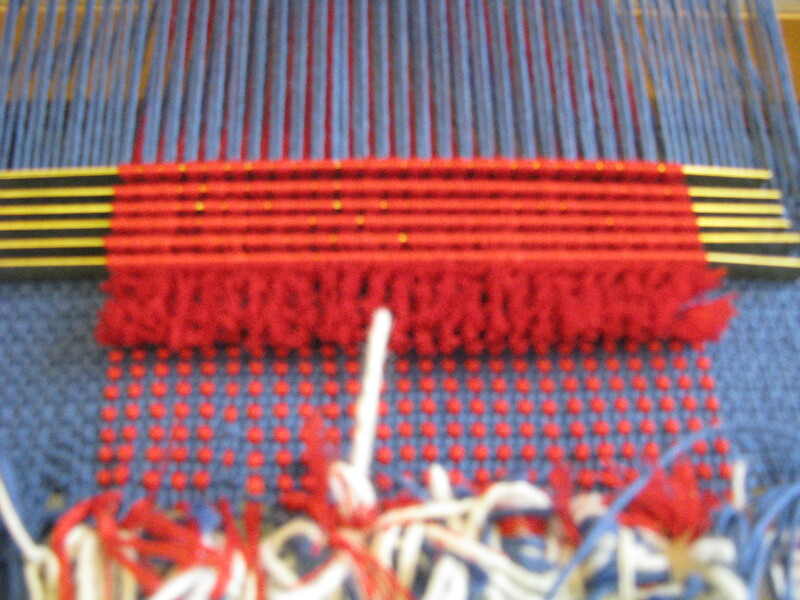 So weaving the header, rather fun really. The silk wanted to come out of the knots I’d put it in, but other than that, things went not poorly. On to the part that makes velvet, the pile. For velvet rods I used 316 stainless steel wire. This was on suggestion of my friend K. when I grumbled to all and sundry on Facebook about what to use. Last time, I used knitting needles which are the wrong scale for this yarn. “Real” velvet rods have a u-shaped profile to aid and abet the cutting of the pile. Wire is round and a single wire is so small as to have the pile sink back out of sight. Thus, I quickly learned that pairs of wires are the way to go. It took a while, but a rhythm was developed. It went something like this: Open pile shed, insert wires, close pile shed, bring beater forward, weave two ground shots. Every so often pull the wires and try not to poke anyone while doing so. My first sample was all uncut pile. 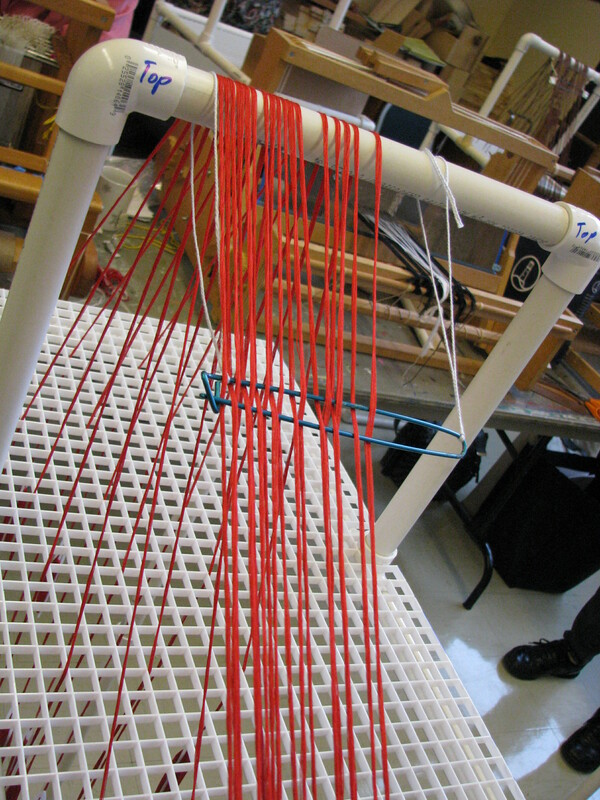 Interesting, but a little boring on loom. Off loom it was rather cool feeling. Closer to real color. Again, note the shiny and knots that are coming undone. The second voided pile in little squares. This was a bit more work (illustrated below), but was much more interesting to do. 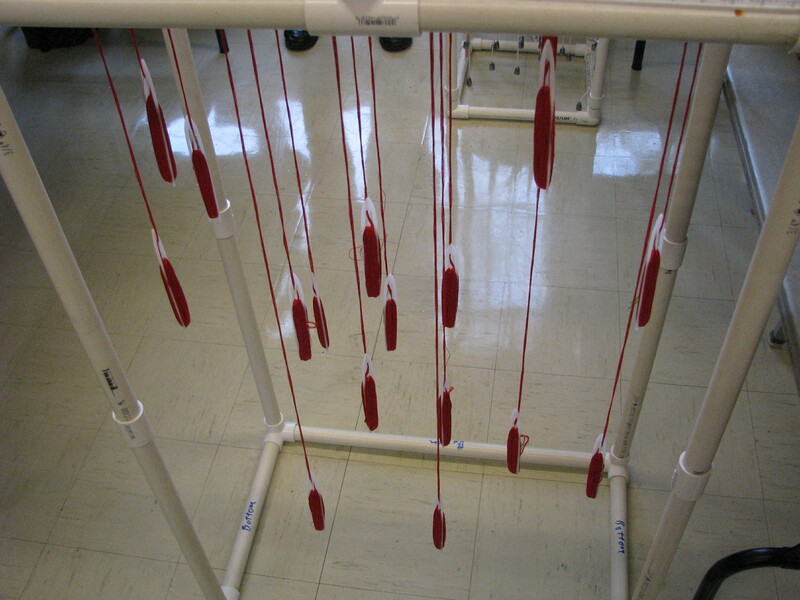 Insert pick up stick to choose correct threads. Once all threads are chosen, move pick up stick to back to create alternate shed. Remove pickup stick and close shed. 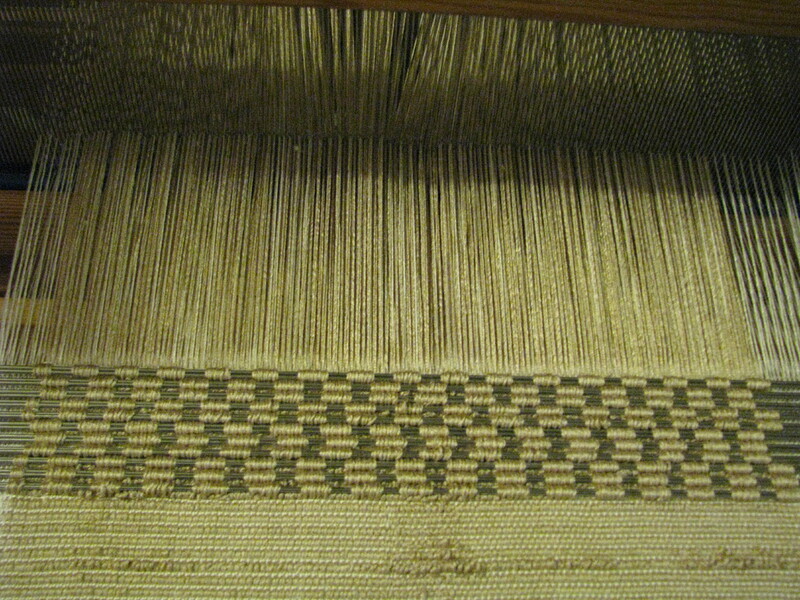 Weave two picks of ground warp and repeat. Wires pulled and slightly bleached by camera. The third sample is my problem child; cut velvet. The pile kept wanting to pull all the way out. I’m not sure what the problem was tho’ I do have some ideas: The cutting implement must be surgically sharp. The other thing is that I had some tension issues that only experience will cure. The fourth sample was a combination of samples two and three, which is to say cut and uncut pile. This was fun and not as persnickety as sample three. The other thing is that is really brought home the light absorption differential. 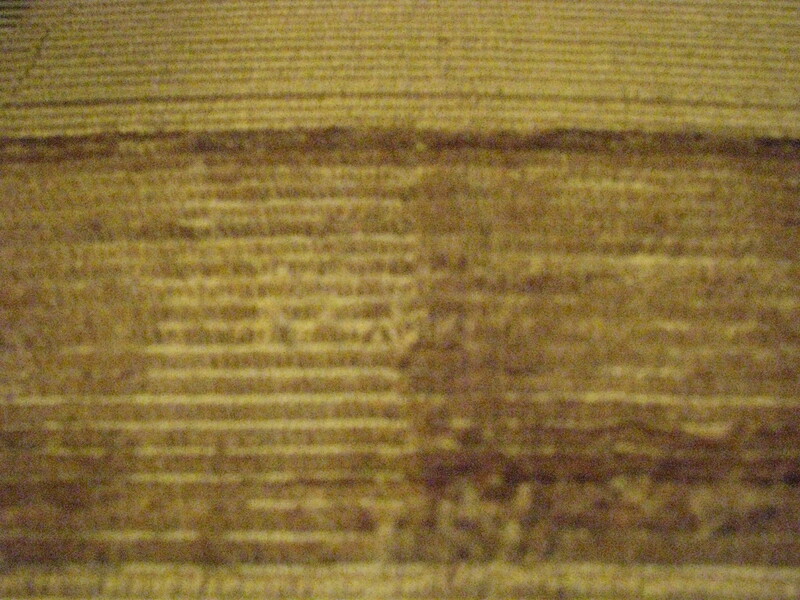 Cut velvet absorbs more light and thus appears darker than uncut velvet. Tension matters and one inch chains are too big. The half inch chains gave less trouble. Silk is not only shiny it is very strong. 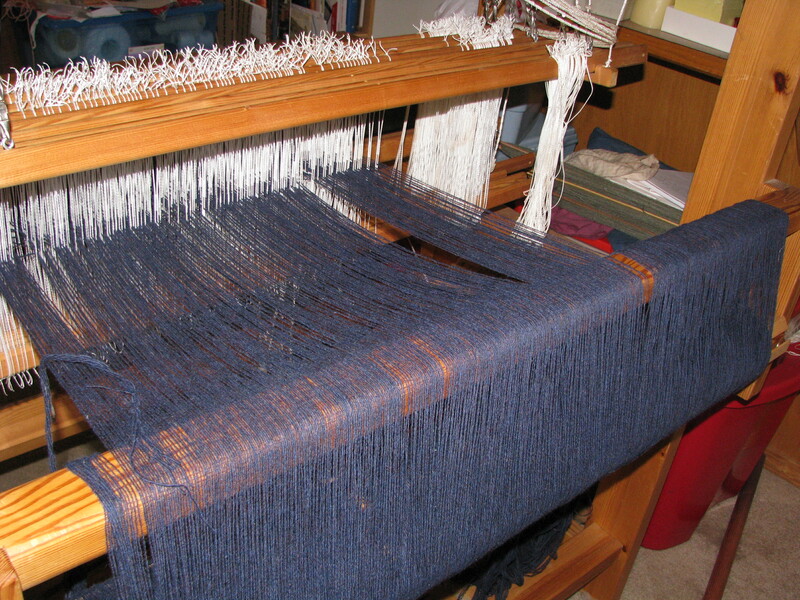 I had a couple heddles snap, but no warp threads, even when they crossed. Entering an Arts and Sciences (yes, I am in the SCA) competition is not for the faint of heart. Arrange to have peer intervention. Related to that, do not be the first one to read the commentary from your judges. Have someone do it for you and summarize. Then you may read the comments. 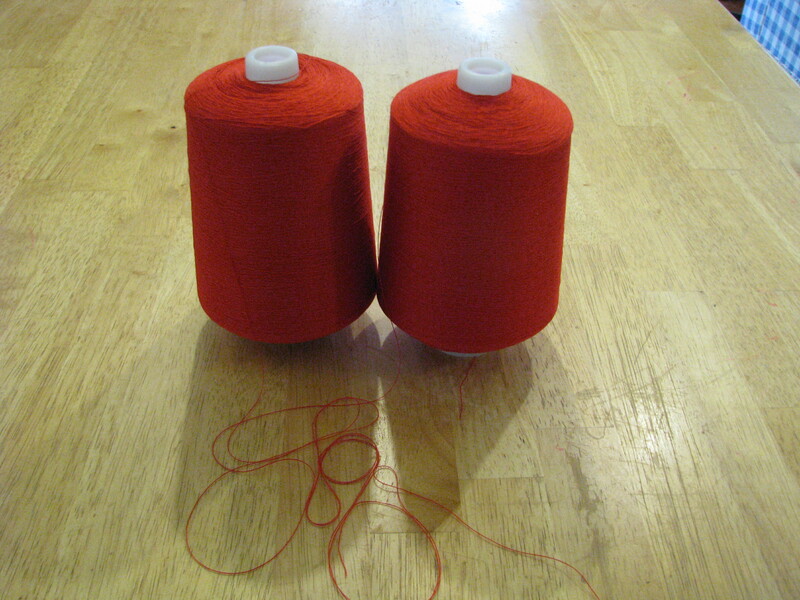 Each new thread/yarn type has different characteristics. Accept this fact as part of the learning curve. Just order more heddles. It makes life easier in the long run. One day I must get to Italy to see the awesome velvets done in person. Always back up your work! My two velvet samplers. Aren’t they cute? 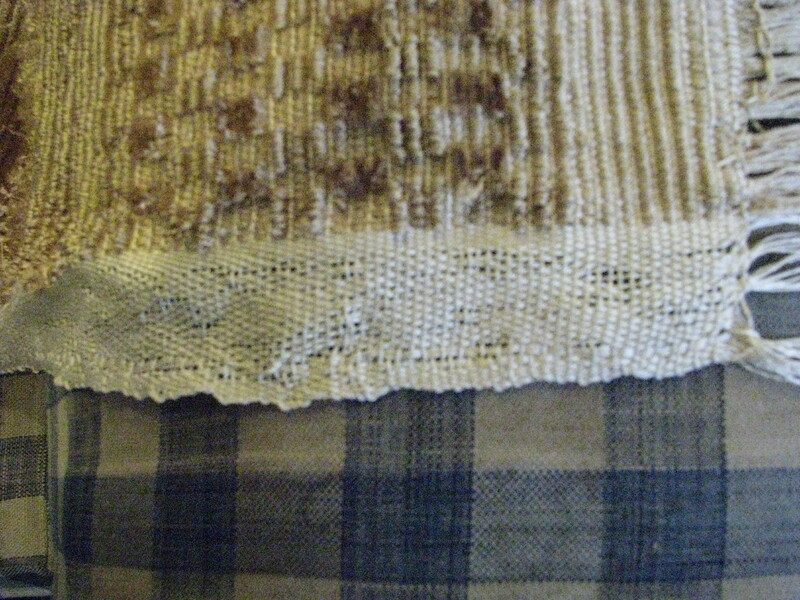 In the next post, we shall examine why those who do not love weaving plaid end up surrounded by those who love it. Since I’ve not posted in a while, here’s a bit of what weaving has been happening. 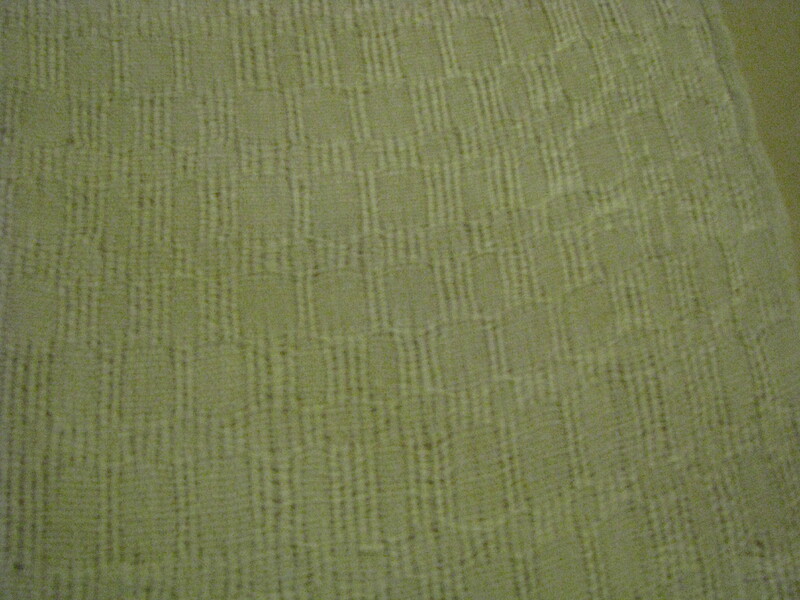 This is a an M&O plaid done in 40/2 linen. Interesting piece; learned I should have been beating harder. 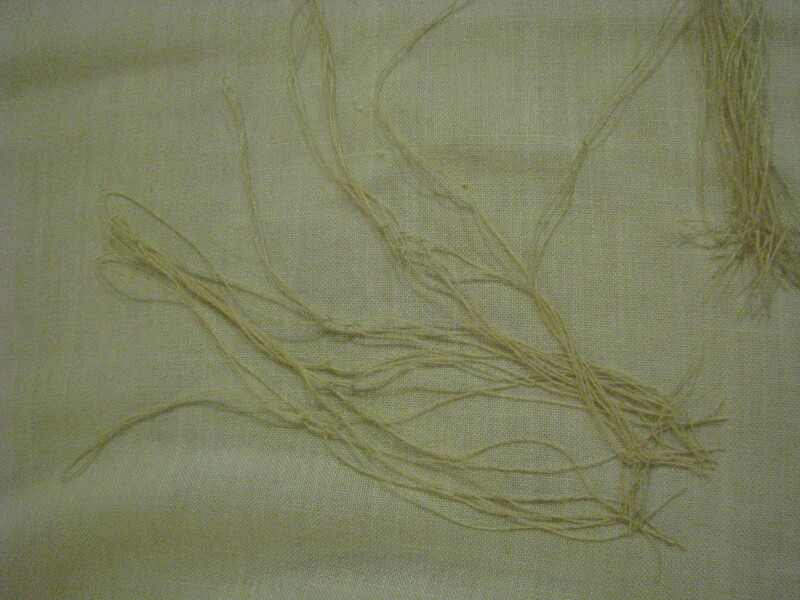 Next up is a piece based on an 11th century relic from Belgium called Mary’s Veil. Think of it as medieval huck weave. 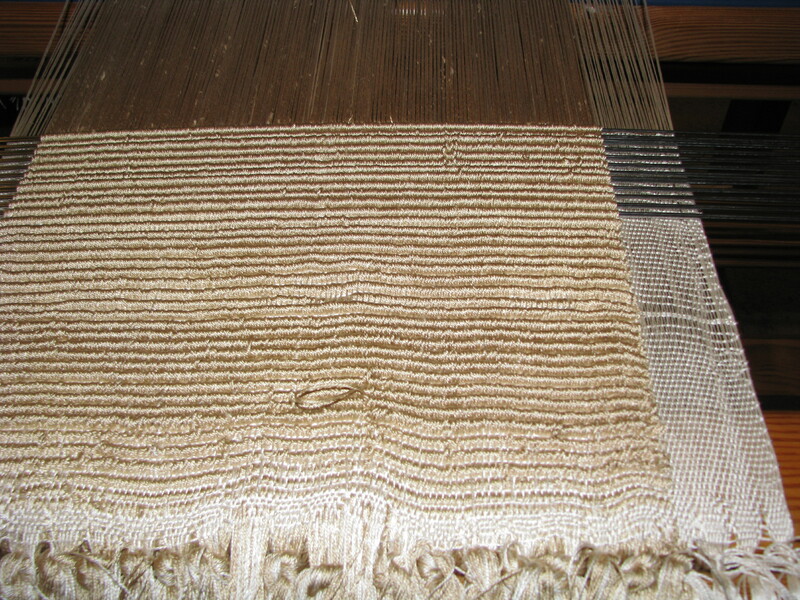 The texture is very interesting, it was quick weaving and I look forward to weaving it with finer threads. Next is yardage for Constance. This is the same Triple Bird’s Eye that gave me such a hard time last year. Seems I’ve learned a bit since then. 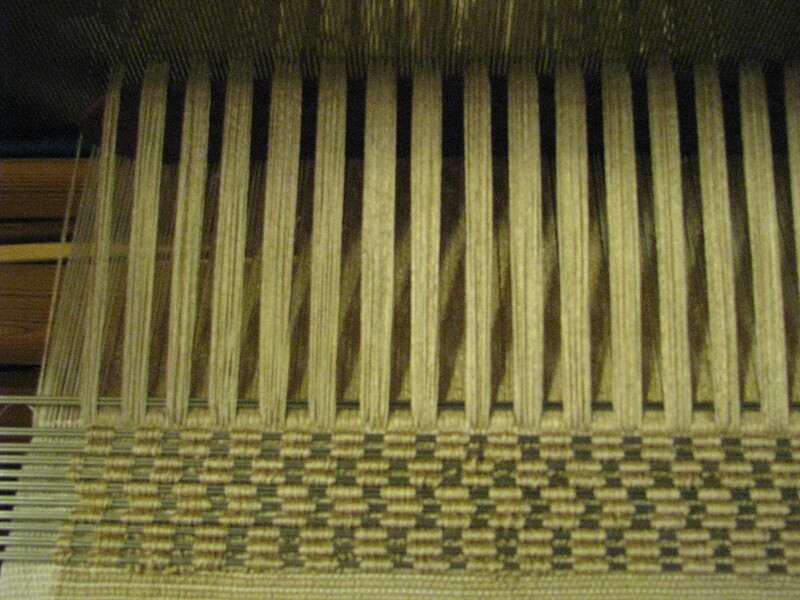 Despite what it appears in the pictures, the weft is actually olive green. 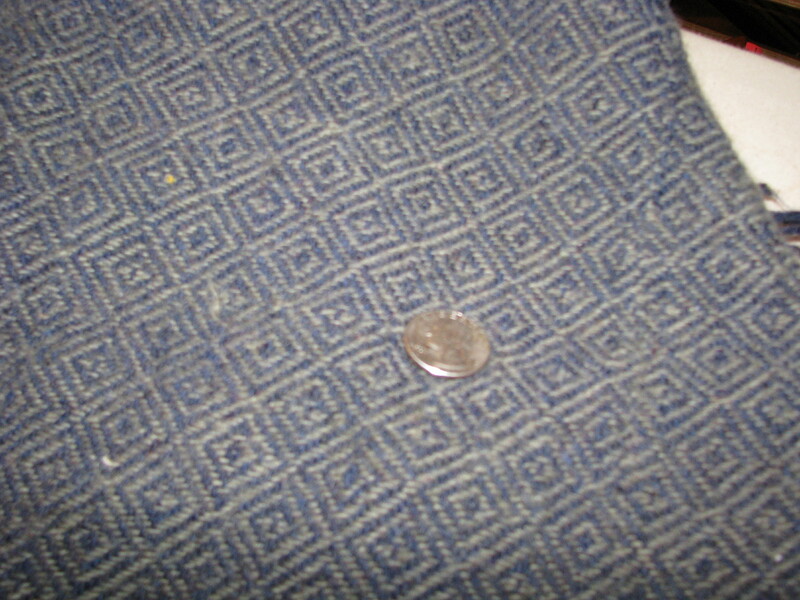 Quarter there for scale. This is post wash.
Now we’re on to the German Bird’s Eye portion of the program. First a blanket for friends Aleyn and Annisia (I’m quite sure Annisia’s name is spelt wrong) and then a mini project to see the difference in scale. Ultimately, the latter will become little bags. 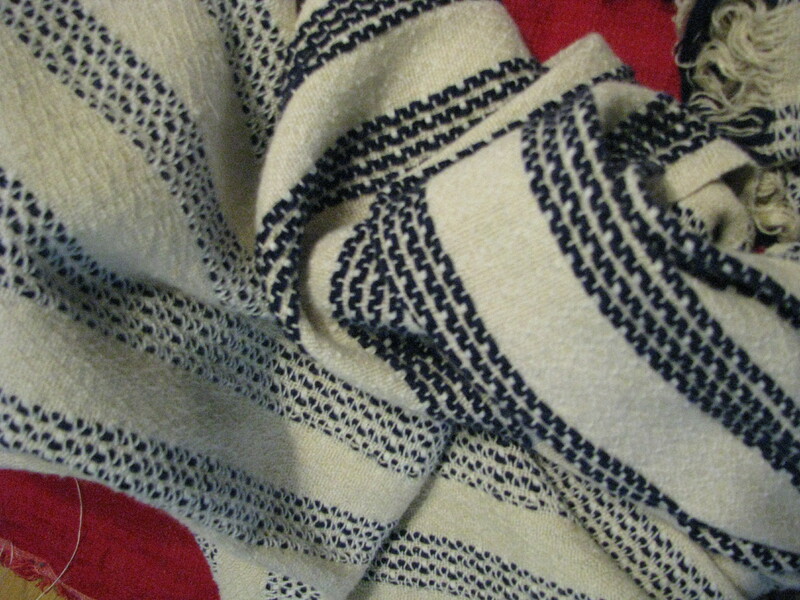 The blanket is wool set at 10epi, the bags are cotlin (a 60/40 cotton linen blend and a joy to work with) set at 30 epi. Weaving all done. On to the washer! It occurs to me that it’s been a long time since I’ve posted. 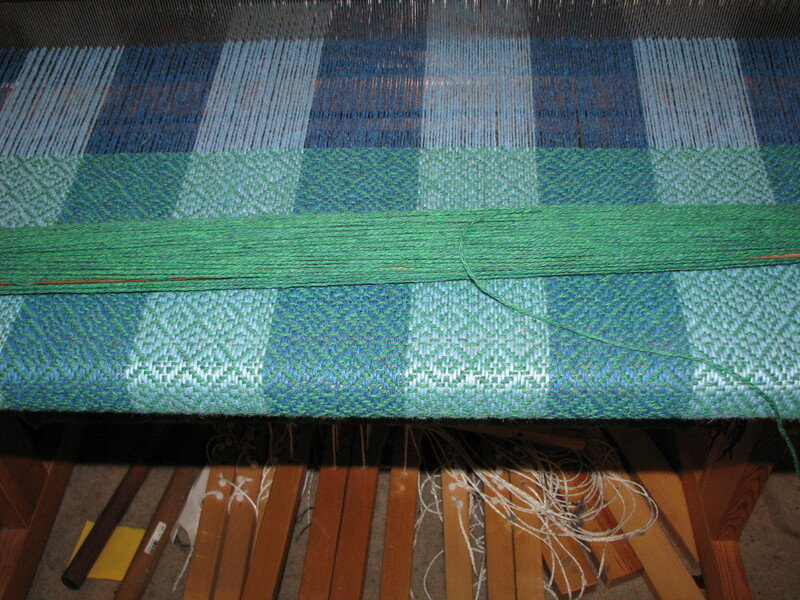 It also occurred to me that part of the point of this blog is to document some of the weaving I’ve done. 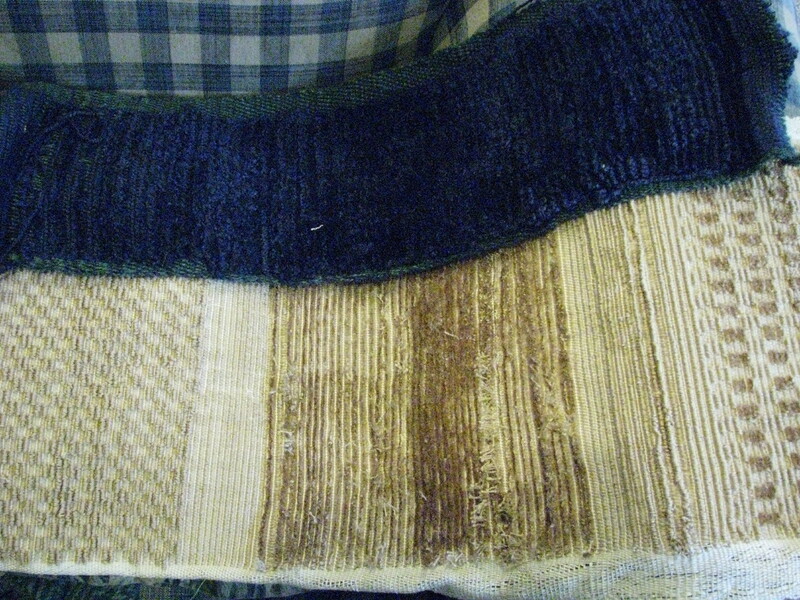 So, here is one project: This is my first (and thus far only) attempt at velvet weaving. For those whom I’ve waylayed with shown my weaving notebooks, yes, I did this a while back. By strictest definition, this isn’t true velvet, but a velvet weave. The yarn for this is a 50/50 silk wool blend. True velvet would be woven of only silk; pile and ground. That is for a later project, likely in a couple months. The yarn for the velvet project. It is DK weight Mirisol Tupa, a silk and wool blend. I also learned a bit about physics. 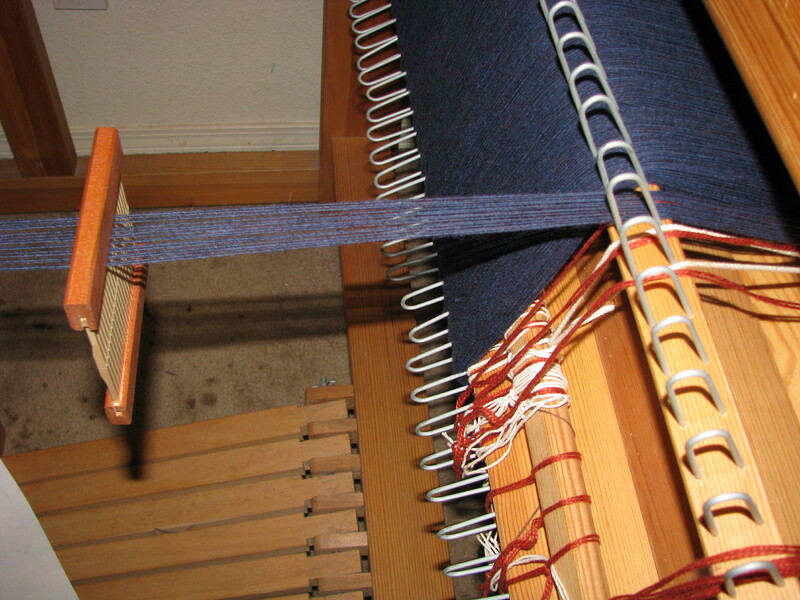 The rigid heddle loom is not the ideal velvet weaving tool for a number of reasons including that it tends to be too light to really pack the weft in tightly. This is important as the plain picks between the pile are what hold the pile picks in. Scale of yarn to project and supplemental tools is also very important. DK yarn is too thick to use lace knitting needles as velvet wires. Normal size (size 7-9) are much more appropriate. Better if double stacked to get a higher pile. It takes a while to get the hang of this. Better view of pile. There are too many ground picks between pile picks. Now it’s starting to work. Yes, those are knitting needles. Historically, patterns were formed by using different sized velvet wires to create different patterns. Alto e basso is one such type. The name means high and low and refers to the pile height. Patterns could also be formed by combinations of cut and uncut loops, also by places of loops and no loops; voided velvet.